The long-awaited meeting between Petro Poroshenko and Donald Trump, expected to take place late last month, never materialized. Instead, the leaders ended up holding telephone talks, details of which remained undisclosed. Ukrainian observers are concerned that Trump's cold shoulder indicates that Washington's patronage for Kiev is coming to an end. On Thursday, Ukrainian news and analysis portal Apostrophe.ua published a worrying analysis, explaining that the long-awaited meeting between Presidents Poroshenko and Donald Trump, "announced for the end of February, never ended up taking place; instead, the heads of state held a telephone conversation, the details of which were not provided by the Ukrainian side. The Ukrainian Foreign Ministry said that preparations for a meeting between the presidents are continuing, but have not named any specific dates." Earlier, Foreign Minister Pavlo Klimkin and Ukrainian Ambassador to the US Valery Chaly repeatedly stated that a meeting between the two leaders was imminent, and would take place sometime before the end of February. Officials said that several possible variants for the meeting were being worked out, including a meeting in New York during the inauguration of Ukraine's chairmanship at the UN Security Council. Unfortunately, Apostrophe.ua noted, "winter is now over, and the promised meeting still has not taken place." Instead, Poroshenko has had to make due with a meeting with Vice President Mike Pence last month at the Munich Security Council. The Ukrainian President declared that the two sides had agreed that questions involving Ukraine or its interests would not be decided "behind Kiev's back." Pence, for his part, marked the importance of implementing the Minsk Agreements, aimed at resolving the civil war in eastern Ukraine. Kiev, Apostrophe.ua noted, has also sent a virtual army of officials to Washington in recent weeks to try to lobby the US Congress. One Congressional staffer recently told US media that Ukrainian lawmakers have become a daily sighting on Capitol Hill, with over 70 politicians descending on Washington for just one of several recent trips. Unfortunately, their efforts don't quite seem to have panned out. This week, lawmakers from the House of Representatives unveiled a new $578 billion Pentagon defense spending bill, in which military aid to Kiev faces being slashed from $350 million to $150 million. The money is expected to be spent on training, equipment, intelligence, logistics, and supplying the Ukrainian military with lethal weapons, with the caveat that lethal aid must exclude man-portable air defense systems. Trump's cold shoulder to Poroshenko is not surprising. In recent weeks and months, observers have repeatedly pointed out Ukrainian officials' efforts to sabotage Trump during the election campaign, from slurs against the candidate to the creation of an official criminal investigation against former Trump advisor Paul Manafort. In this situation, it makes sense that Trump is apprehensive, to put it mildly, to establish personal contact with the Ukrainian leader. Nonetheless, Apostrophe.ua's concerns notwithstanding, Ukrainian officials have continued to promote their narrative that Kiev has already established a normal working relationship with Washington, and continue to emphasize that a meeting between Trump and Poroshenko will take place, any day now. 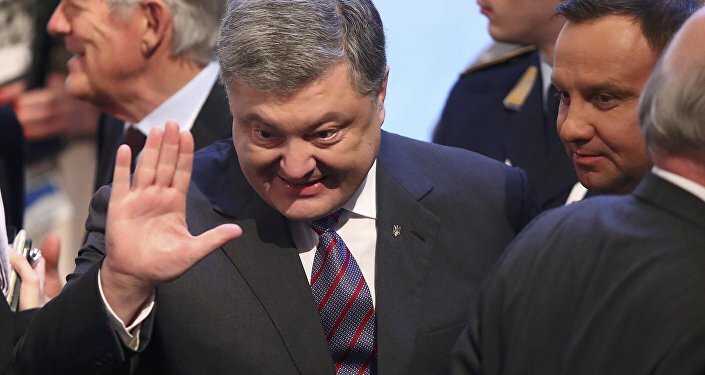 Ukraine's Vesti online newspaper recently published a critical piece over Kiev officials' endless promises, noting half-jokingly that until Poroshenko's much-awaited visit with Trump is actually confirmed by the White House, Kiev's promises will look just like the 'thousand and one promises of a visa-free regime' with Europe, "which Poroshenko generously dispensed over the last several years" without actually achieving anything. Speaking to Apostrophe.ua, Nikolai Vorobyov, a Ukrainian Washington-based lobbyist and director of the Center for Eastern European Prospects, said that it's no accident that a meeting between Poroshenko and Trump has not taken place. The White House, he said, has a low level of trust in Ukraine's leaders, and lacks an understanding of the situation in the Eastern European country. "I think that Ukraine's fate will essentially be resolved without Ukraine by more serious players, such as Germany, the USA, and Moscow," Vorobyov said. "In this sense, right now 'notes are being compared' on this [higher] level. Then, Kiev will be notified about the agreement that has been reached." Ukraine, the analyst lamented, "is an object, rather than a subject of geopolitics, and I think that whatever agreement the big players arrive at will be presented, in one form or another, to Ukrainian officials. And only after that will a meeting between the Ukrainian President [and Trump] be agreed to. "Trump is very pragmatic," Vorobyov emphasized. "He is interested in real results. He has seen that in the last two and a half years, Ukraine has not improved its [internal] situation in spite of the large financial infusions that were made, and the support of international organizations." For his part, Ukrainian international affairs commentator Vladimir Volya proposed that a Trump-Poroshenko meeting will be held off until later in the spring. "The topic of Russia and Ukraine is not an easy one for the Trump team, given that it has been used as an instrument by the Democratic Party and hawks among the Republicans to fight Trump," the analyst said. "Now that the new administration is strengthening its positions, I think that a meeting [between Trump and] the Ukrainian President will take place no earlier than the end of March, or even April." "For Trump the priority will be meeting with Putin," Volya concluded.